Soak rice and moong dal for 3-4 hours. Remove water and grind it in the mixture. Add water as per need to grind it to prepare the batter, it should not be thick like dosa. Add capsicum, spinach, coriander leaves, salt, maida/rice flour and mix it well. Maida helps in binding and making it crispy. Take non-stick tawa and heat it. 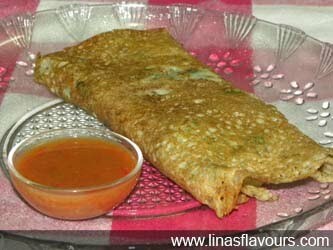 Add oil, pour the batter and spread it evenly to make thin dosa. Cook on both the sides. Serve it hot it date-red chilly chutney.